No bake, super easy PB & J protein bites covered in dark chocolate! Recipe: 2 scoops vanilla or PB whey protein (I used trutein vanilla bean) 1/2 cup gluten free oats, 1/3 cup dried fruit ( I used blueberries, cranberries and golden raisins from traderjoes) 1/3 cup natural almond butter, 2 tbsp natural raspberry jam (I like Crofters!) 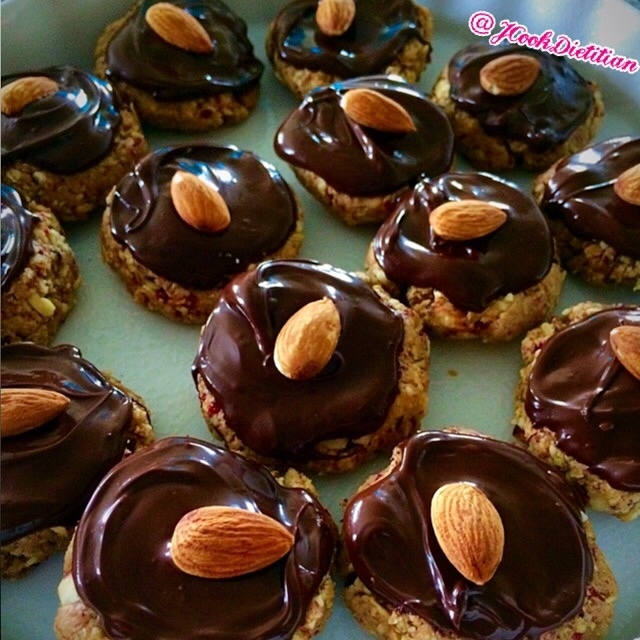 1/3 cup raw almonds. Blend all ingredients and form into bites! Then melt in the microwave 1/2 cup Lilly's dark chocolate chips sweetened with stevia and top with an almond. Store in the fridge or eat straight away! This recipe makes 15 treats! !